Palliative care has developed rapidly and heterogeneously in the past decade around the globe. In this chapter, we present an overview of palliative care development in different regions of the world with a pair of case studies of models of palliative care delivery within each region. The textbook is divided into subsections based on the following regions: Europe, North America, Latin America, Africa, Asia-Pacific, and Middle East. Regions were decided based on existing palliative care networks, where available. Information regarding palliative care development in each region is organized based on the World Health Organization’s Public Health Strategy for Palliative Care: (1) policies, (2) medicine availability, (3) education, and (4) implementation of services plus (5) vitality (professional activity). This chapter is intended for the reader to gain a high-level view of the state of palliative care development in regions of the world and the challenges and successes within each region. Two case models per region give the reader a quick view into the diversity of palliative care services offered in different regions of the world and give the reader insight into regional-specific delivery models. African Palliative Care Association. Consensus statement for strengthening palliative care as a component of comprehensive care throughout the life course in Africa – “The Kampala Declaration 2016”. Kampala; 2016a. Retrieved from http://www.thewhpca.org/resources/item/the-kampala-declaration-2016. African Palliative Care Association. 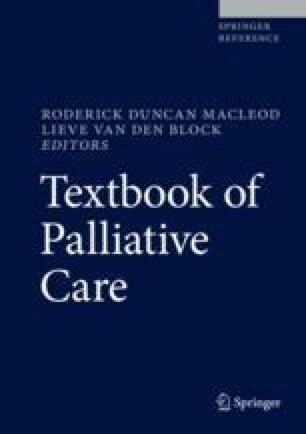 Review of the status of palliative care in ten southern African countries. Kampala: African Palliative Care Association; 2016b. Retrieved from https://www.africanpalliativecare.org/images/stories/pdf/REVIEW_OF_THE_STATUS_OF_PALLIATIVE_CARE%20IN_TEN_SOUTHERN_AFRICAN_COUNTRIES_Report.pdf. Asia Pacific Hospice Palliative Care Network (Producer). 15th Anniversary special issue. Newsletter Issues. October 17, 2016. Retrieved from https://gallery.mailchimp.com/71e579820cfca9226d20e3fca/files/Issue_20_15th_Anniversary.compressed.pdf. Canadian Hospice Palliative Care Association. 2016. Retrieved from http://www.chpca.net/about_us/history.html. Canadian Society of Palliative Care Physicians. History & accomplishments. 2014. Retrieved from http://www.cspcp.ca/about/history/. Center to Advance Palliative Care. About the Center to Advance Palliative Care. 2017. Retrieved from https://www.capc.org/about/capc/. Centers for Disease Control and Prevention. Injury prevention & control: opioid overdose. 2016. Retrieved from https://www.cdc.gov/drugoverdose/data/prescribing.html. Council of Europe. Recommendation Rec (2003) 24 of the Committee of Ministers to member states on the organisation of palliative care. 2003. Retrieved from https://wcd.coe.int/ViewDoc.jsp?id=85719. Covenant Health. PC matters: building national consensus. 2017. Retrieved from http://www.palliativecarematters.ca/home/. El servicio de Cuidados Paliativos ha atendido casi 15.000 llamadas este año [Press release]. 2013. Retrieved from http://www.madrid.org/cs/Satellite?cid=1354287017608&language=es&pageid=1159444389315&pagename=PortalSalud%2FCM_Actualidad_FA%2FPTSA_pintarActualidad&vest=1159444389315. European Association for Palliative Care. National palliative care associations in Europe. 2016. Retrieved from http://www.eapcnet.eu/Home.aspx. Hospice Africa Uganda. 2016a. Retrieved from http://www.hospiceafrica.or.ug/index.php/about-us. Hospice Africa Uganda. Education. 2016b. Retrieved from http://www.hospiceafrica.or.ug/index.php/education. Hospice Casa Sperantei. 2015 Annual report. 2016. Retrieved from http://www.hospice.ro/media/2016/08/HCS_Raport-Anual-2015_online.pdf. Human Rights Watch. Ending needless suffering in Francophone Africa. 2015. Retrieved from https://www.hrw.org/news/2015/10/09/ending-needless-suffering-francophone-africa. International Narcotics Control Board. Report of the International Narcotics Control Board for 2015. 2015. Retrieved from https://www.incb.org/incb/en/publications/annual-reports/annual-report-2015.html. Lien Collaborative for Palliative Care. Documentary reveals the challenges and triumphs of bringing palliative care to parts of Asia & how pain relief eludes the dying [Press release]. October 8, 2016. Retrieved from http://lifeaskeddeath.com/downloads/Life-Asked-Death_Press-Release_6-Oct-2016.pdf. Merino MTG-B. PAL24, el modelo de atención integral y continuada de los pacientes de Cuidados Paliativos en Madrid [Press release]. 2016. Retrieved from http://isanidad.com/69478/pal24-el-modelo-de-atencion-integral-y-continuada-de-los-pacientes-de-cuidados-paliativos-en-madrid/. National Cancer Institute. Palliative care in cancer. 2010. Retrieved from https://www.cancer.gov/about-cancer/advanced-cancer/care-choices/palliative-care-fact-sheet. National Coalition for Hospice and Palliative Care. About us. 2017. Retrieved from http://www.nationalcoalitionhpc.org/DisplayPage.aspx?Title=Welcome!. National Hospice and Palliative Care Organization. History of hospice care. 2015a. Retrieved from http://www.nhpco.org/history-hospice-care. National Hospice and Palliative Care Organization. NHPCO’s facts and figures: hospice care in America. 2015b. Retrieved from http://www.nhpco.org/sites/default/files/public/Statistics_Research/2015_Facts_Figures.pdf. National Palliative Care Research Center. 2013. Retrieved from http://www.npcrc.org/. Pain and Policy Studies Group. Country profiles. 2014a. Retrieved from http://www.painpolicy.wisc.edu/country/profile/united-states-america. Pain and Policy Studies Group. WHO Regional Office for Africa (AFRO). 2014b. Retrieved from http://www.painpolicy.wisc.edu/who-regional-office-africa-afro. Pain and Policy Studies Group. WHO Regional Office for the Americas (AMRO). 2014c. Retrieved from http://www.painpolicy.wisc.edu/amro-0. Pain and Policy Studies Group. WHO Regional Office for the Eastern Mediterranean (EMRO). 2014d. Retrieved from http://www.painpolicy.wisc.edu/who-regional-office-eastern-mediterranean-emro. Pain and Policy Studies Group. WHO Regional Office for the Western Pacific (WPRO). 2014e. Retrieved from http://www.painpolicy.wisc.edu/who-regional-office-western-pacific-wpro. Pallium Canada. About us. 2017. Retrieved from www.pallium.ca. Pastrana T, De Lima L, Wenk R, Eisenchlas J, Monti C, Rocafort J, Centeno C. Atlas de Cuidados Paliativos de Latinoamérica. 2012. Retrieved from Houston http://cuidadospaliativos.org/publicaciones/atlas-de-cp-de-latinoamerica/. Patient Quality of Life Coalition. About PQLC. 2017. Retrieved from http://patientqualityoflife.org/about-pqlc/. Plan Estratégico de Cuidados Paliativos de la Comunidad de Madrid. 2010. Retrieved from Madrid http://www.madrid.org/cs/Satellite?blobcol=urldata&blobheader=application%2Fpdf&blobheadername1=Content-disposition&blobheadername2=cadena&blobheadervalue1=filename%3DPlan_Cuidados_Paliativos.pdf&blobheadervalue2=language%3Des%26site%3DPortalSalud&blobkey=id&blobtable=MungoBlobs&blobwhere=1352856122126&ssbinary=true. Shamieh O. Palliative care in North Africa and the Middle East: Jordan perspectives. 2016. Retrieved from https://eapcnet.wordpress.com/2016/05/18/palliative-care-in-north-africa-and-the-middle-east-jordan-perspectives/. Sixty-seventh World Health Assembly. Strengthening of palliative care as a component of comprehensive care throughout the life course. Geneva. May 24, 2014. Retrieved from http://apps.who.int/gb/ebwha/pdf_files/WHA67/A67_R19-en.pdf. The Association of Faculties of Medicine of Canada. Educating future physicians in palliative and end-of-life care. 2008. Retrieved from Ottawa https://afmc.ca/pdf/Educating%20Future%20Physicians%20in%20Palliative%20and%20End-of-Life%20Care-e.pdf. WHPCA, WHO. Global atlas of palliative care. 2014. Retrieved from http://www.who.int/nmh/Global_Atlas_of_Palliative_Care.pdf.